If Dmitry Medvedev becomes the next prime minister, the political elite is in for some serious shocks, at least according to political scientists from both Russia and abroad. Peskov did not speculate further on the makeup of a Medvedev cabinet. “No one knows the composition of the new government yet, and it will be formed in the same way as in the spring of 2008, when Putin and Medvedev were compiling the lists of ministers together right up to the inauguration,” he said. Actually, the only thing that is clear at this point about the composition of a future government is that Alexei Kudrin will not be a part of it. After Kudrin stated his dissatisfaction with the plans proposed at the United Russia party congress, Medvedev asked for his resignation. He left his post as Finance Minister on Sept. 26. Experts are divided on the economic consequences of the ruling tandem’s decision. Independent analyst Alexander Trifonov believes that Putin’s return to the post of president will frighten off investors. “Putin’s harsh politics will not help to improve the investment climate,” Trifonov said. But Ilya Gorbunov, editor-in-chief of “Bolshoy Biznes,” believes that it will be easier for major partners to operate if they can rely on Putin-style stability. “Global investors have already worked with Vladimir Putin both as president and as prime minister. I think we should now expect the forecasts by the Ministry of Economic Development and the Ministry of Finance to be fulfilled and the currency rate to return to its customary parameters,” he said. While the country is in need of economic reforms and Putin has the political power to carry them out, he might lack the political will. Changes ““will bring with them political risks and unpopular decisions, and that might stop Putin,” said former Economic Minister Yevgeny Yasin. And there is another problem with continuing the drive towards modernization—the plans put forward in the past few years to establish an innovation economy are associated with Dmitry Medvedev. Political scientist Gleb Pavlovsky thinks that by agreeing to the swap, Medvedev has weakened his position. 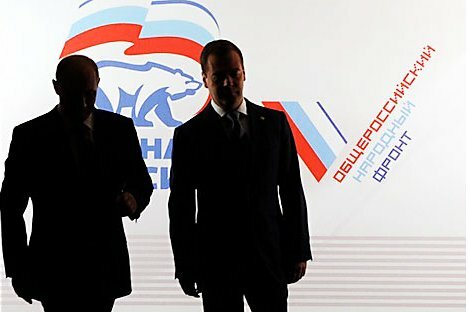 “By all accounts, Medvedev has tens of millions of supporters in the country, and by declining to fight for the presidency he is turning his back on them without giving them any explanation. This is to some extent similar to the case of Prokhorov with the Right Cause party, except it’s on a giant scale,” Pavlovsky said.